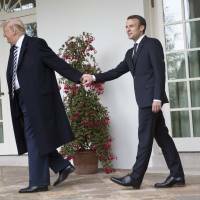 WASHINGTON - Give President Emmanuel Macron of France an A for effort — he is pulling out all the stops in his effort to manage the mercurial Donald Trump. 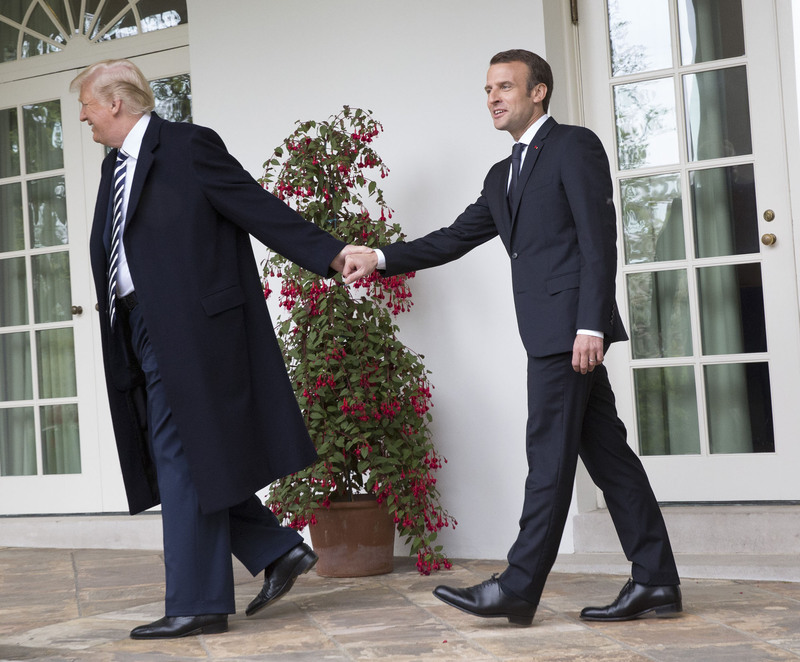 Last week, Macron visited Washington for what was surely the handsiest summit in the history of French-American diplomatic relations, as part of his continuing bid to influence a volatile U.S. president by hugging him as tightly as possible. Macron’s is a strategy that a number of U.S. allies have been pursuing, and so far it has borne some fruit. But now it is about to be tested in big ways. Trump’s election was alarming to the vast majority of U.S. allies. The “leader of the free world” was now a man who was clearly skeptical of America’s global role, who believed that many U.S. partners were deadbeats, and whose first diplomatic impulse was to tear down multilateral agreements that his predecessor had spent years constructing. The most powerful country in the world had elected a diplomatic novice with an often-destructive personality. “A world is collapsing before our eyes,” France’s ambassador to the United States wrote just after Trump’s election. There seemed a high probability that U.S. policy would now veer in dangerous directions. U.S. allies have since dealt with this problem in a number of ways. Some countries have simply sought to keep their heads down — to avoid antagonizing Trump in hopes of making it through his administration unscathed. Others, such as Germany’s Chancellor Angela Merkel, have occasionally taken a more confrontational tone, publicly chiding Trump for withdrawing from the Paris climate accords and pursuing other policies seen as damaging. Yet confrontation is a problematic strategy in dealing with a country as strong as the U.S., particularly with a president whose urge is normally to escalate rather than de-escalate when attacked. So other U.S. allies have chosen a different option. They have mostly declined to challenge Trump head-on, even when they are alarmed by the policies he proposes, but instead have pulled him close in hopes of whispering in his ear and moderating his behavior. Prime Minister Shinzo Abe pioneered this strategy, with the assistance of psychologists who produced a detailed personality profile of Trump. Abe visited Trump Tower just days after the presidential election in hopes of forging a personal relationship; he followed up with an official visit in February during which the two leaders bonded over their love of golf. Japanese officials also played to Trump’s self-image as a deal-maker and a job creator, announcing new investments in the U.S. and allowing him to take the credit. The goal of all this has been to develop personal ties that will insulate Japan from some of the shocks — on trade, on North Korea, or on other issues — it might otherwise suffer in a Trump presidency. After initially experimenting with a more confrontational approach — manifested in the handshake for the ages last July — Macron has taken a similar tack. He shrewdly invited Trump to Paris for the Bastille Day military parade, knowing the president would love this display of martial pomp. He has reportedly bonded with the president over their shared status as political outsiders who are determined to shake things up, and stayed in close contact through personal notes and regular phone calls. To be sure, Macron is no fan of Trumpism, as he made clear last Wednesday in an address to Congress that was, in many ways, an implicit rebuke of the president’s policies and fear-mongering style. Yet he has nonetheless cultivated a rapport with Trump in a bid to keep him from starting a trade war with Europe, withdrawing from the Iran nuclear deal, or otherwise upsetting global politics too severely. This is a mostly sensible strategy, given the limits of the allies’ ability to change American behavior through anything other than persuasion. It is hard to imagine anything else working with a president who styles himself a “counterpuncher” who hits back 10 times harder when provoked. And there have undoubtedly been some results. During the opening months of the administration, for instance, Abe’s approach shielded Japan from the ire that Trump directed toward America’s European allies, and won strong presidential affirmations of the Japan-U.S. alliance amid a sharpening confrontation with North Korea. For his part, Macron claims to have persuaded Trump not to pull U.S. troops out of Syria prematurely. Whether or not this is true, his strategy has at least given France a stronger voice in Washington than any other European ally enjoys. Yet the fact that Trump is Trump still makes any strategy predicated on managing him perpetually precarious, as even the most diligent practitioners of this approach have discovered. For one thing, the best buddy approach hasn’t always protected U.S. allies from the unwelcome attacks and about-faces that seem to be Trump’s diplomatic specialty. Trump and Abe may be golfing buddies, but that didn’t prevent the president from blindsiding Tokyo with his aluminum and steel tariffs — or subsequently denying Japan, at least initially, an exemption from those tariffs. Nor, apparently, did Abe’s personal diplomacy win him advance warning of Trump’s spur-of-the-moment decision to shift toward direct engagement with North Korea’s Kim Jong Un. For both Japan and France, moreover, the biggest tests of this strategy are still to come, and there are reasons to be worried about how well it will fare. Abe is banking that his close ties to Trump will ensure that Japanese interests are safeguarded in any U.S.-North Korea negotiation, but Trump’s shoot-from-the-hip style and “America First” instincts surely have Japanese diplomats worried. Likewise, Macron has clearly wagered that close personal engagement will help dissuade Trump from ditching the Iran nuclear deal, so long as the European parties to that deal agree to address some of the president’s critiques. Trump, however, has so far refused to say whether he will stay or go, and even blasted the deal as “insane” and “ridiculous” in Macron’s presence on Tuesday. U.S.-European negotiations on tightening and extending some key provisions of the deal are reportedly making progress, but Trump has been so vocally hostile to that agreement that it may well not survive over the long term. Should Trump decline — whether now or later — to keep the U.S. in the pact, Macron will be in the embarrassing position of having courted the president only to end up spurned by him. This points to a final liability of the Trump-whisperer strategy — it can easily turn into a political liability for the leaders pursuing it. To say that Trump is unpopular overseas is something of an understatement. Macron is already being lampooned in France for getting so close to the American president. A little ridicule may be a small price to pay so long as Macron and other leaders can assure themselves — and their voters — that they are having a positive impact on U.S. policy. But if Trump leaves them in the lurch, then they may find that the geopolitical benefits of hugging him are less than expected, and the political price is high indeed. Hal Brands is the Henry A. Kissinger distinguished professor at the Henry A. Kissinger Center for Global Affairs at Johns Hopkins University’s School of Advanced International Studies and a senior fellow at the Center for Strategic and Budgetary Assessments.